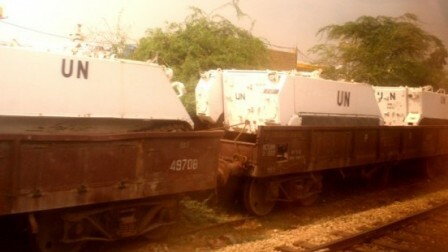 Seventy plus army batteries and UN 'peace keeping' vehicles. 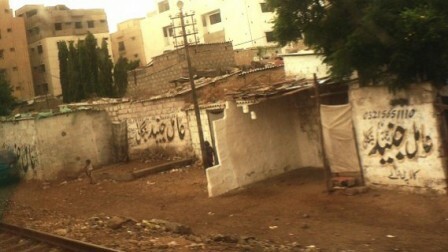 Riding the train into and out of Karachi is an unforgettable experience, albeit a mostly unpleasant one. Self-proclaimed Alim, Junaid Bangali has a graffiti ad campaign which starts 40km outside of Karachi and appears on walls every 200m or so all the way to his den of kala jadoo (black magic) in the squalid urban mish-mosh under Kalapul bridge. The sheer number of ads suggests Mr Bangali has pulled a fast one on yet another poor sap, advising him/her to paint 700 signs as payment for some form of miracle cure or the other. If you visit Bangali sahib, he will tell you that the government has ordered a complete crackdown on magic all-sorts, and he himself can only offer Quranic ayats as solace to suffering people. Slip him Rs 2,000 and he will apparently show you your future in a glass mirror. 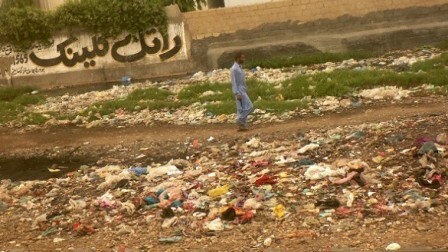 Sure, trash is visible along railway tracks all across Pakistan, but Karachi’s trash is truly of epic proportions. Mounds and mounds of it. Gargantuan piles of it. A veritable Mount Olympus for the gods of rotting bananas, wrappers aplenty, boxes, cartons, paper, plastic, plastic plastic and just about everything including the kitchen sink. The iridescent mix of garish plastic bag colours dipped gently in open naalas would make Andy Warhol proud. 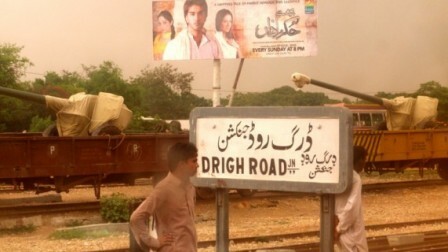 You know you’re close to Karachi just by the smell of it. 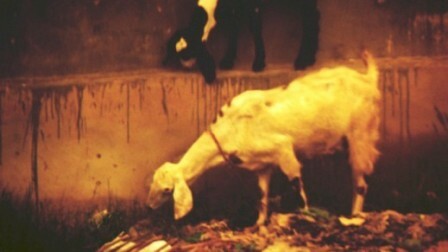 It’s true, Karachi goats seem to prefer munching down on rubbish more than the occasional outcrop of grass which happens to be growing on (you guessed it) more rubbish. I can’t help but wonder, will one of these pathetic creatures end up on the dinner table one day? My dinner table? It’s sad to see this piece of graffiti still visible on the odd wall or two, now partially covered in blood-red paan, sometimes half hidden by piles of trash. Perhaps this slogan still brings solace to some, but I find it grim, and disrespectful, given its surroundings. Hidden by bushes just a stone’s throw from Shahrah-e-Faisal run the trains headed up north to keep the War on Terror on track. Tanks, batteries, missile launchers and more. 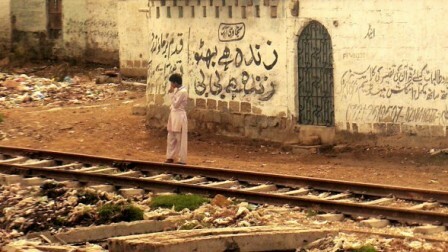 Hundreds of them placed one or two apiece on bogies headed from the Karachi port to FATA and Afghanistan. It’s almost comical to see such a vast array of weapons sitting peacefully alongside outdoor ads for TV dramas and toothpaste. It’s good to be back in Karachi. Haha. That’s quite an experience.